It is with great sadness that I must let you know one of our longest standing shop keepers died on the 29th of January this year. ALBIN OSSOWSKI , known to all as Alec, was born in Starograd, Poland in 1922 and after retiring from his business on The Pimlico Road, returned to his beloved Poland where he died this year in his home town. His three sons, Mathew, John and Mark keep the business going and it is to them that we offer our deepest sympathy. 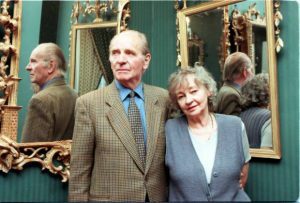 From conversations I had with Alec and his wife, Maria , born in 1925 in Zakopane, Poland, who sadly died quite a few years ago in April 2011, I gleaned small snippets of their remarkable lives. He grew up in rural Poland , a bright and talented school boy and diligent boy scout. He bacame a soldier as war loomed. As a catholic family with deep religious beliefs he then joined the Polish Resistance and did his utmost to help Jew’s flee the holocaust. He survived brutal SS Interogation and ended up in Auschwitz and Buchenwald Concentration Camps, still baring the physical scars of the tattooed registration number on his arm let alone the horrific memories. Upon liberation he was sent to the Allied Resettlement Camp at Northeim where he met his wife. Maria had been liberated by the Russians but escaped with three friends and bicycled back to the American British front. They were soon married and Mathew their eldest son was born in Italy in 1946. Surviving these horrors they became refugees. Before leaving Italy Alec acted in some films , notably “The Long Road” , a film based on the exploits of the Polish Army at Monte Casino. On moving to England he and Maria continued to act in the theatre and for Polish troops in the various camps in England, supplementing his income as a painter and decorator. Alec was active in talking about his experiences of these awful war years , through lectures and discussion groups at schools and colleges, so that future generations would not forget what horrors mankind is capable of and to guard against there recurrence . He and Maria left an oral testament to these experiences in the archives of the Imperial War Museum. He was a gifted wood carver since childhood and with these skills, he eventually found his metier. First he enrolled at The Sir John Cass Institute to study sculpture. With the help of some of his English friends Alec purchased the lease of his shop on The Pimlico Road in 1960, in what was then a small high street of fruit and vegetable shops, pawn brokers, butchers , cobblers and launderettes serving the grander houses of Belgravia. He basically led the way to what has now become such a thriving centre for Art , Antiques, Interior Design and the manufacture of specialist goods across several disciplines. His skills led him into the Restoration of period gilt wood furniture eventually specialising in looking glass frames. He became a renowned expert in 18th century gilt wood of all sorts. His remarkable skill as a Sculptor led him to create unique original works of art as well as exquisite copies of earlier fruit and floral swags, looking glass frames , stands and brackets for clients around the world . He trained his sons in these fields, all becoming gifted in their own way, who still uphold the traditions of his craft here on The Pimlico Road. Despite the horrors he experienced in Poland Alec wished to return to his roots. Maria could not face the many reminders of her country’s past horrors and was content to remain in England. When she died, Alec returned full time to a rural small holding near Starograd ,way up in the North of Poland near the Baltic coast, where he enjoyed planting fruit trees , growing vegetables, rearing animals and restoring the old house. His remarkable life is a testament to his strength of character and fortitude during terrible times. His skill as a gifted craftsman will survive down the centuries in the many beautiful pieces he created or restored. His friendship will be treasured by those who knew him. In fond memory of a dear friend.